Harrison Vs Lane Added To Ring of Combat 57 | Lou Neglia's Ring of Combat | Next Generation of Mixed Martial Arts! Just when you thought ROC 57 could not get any better, Lou Neglia’s adds a super fight for fight fans and casual sports fans. In just his sixth pro fight, Harrison won the prestigious ROC featherweight title and defended one time before leaving to join the ranks of Titan Fighting Championship where he also won their featherweight title. Now he sets his eyes on November 18th where he meets TUF veteran, Julian Lane. Julian “Night Train” Lane made his ROC debut this past September when he challenged lightweight champ, Bradley Desir (9-5). 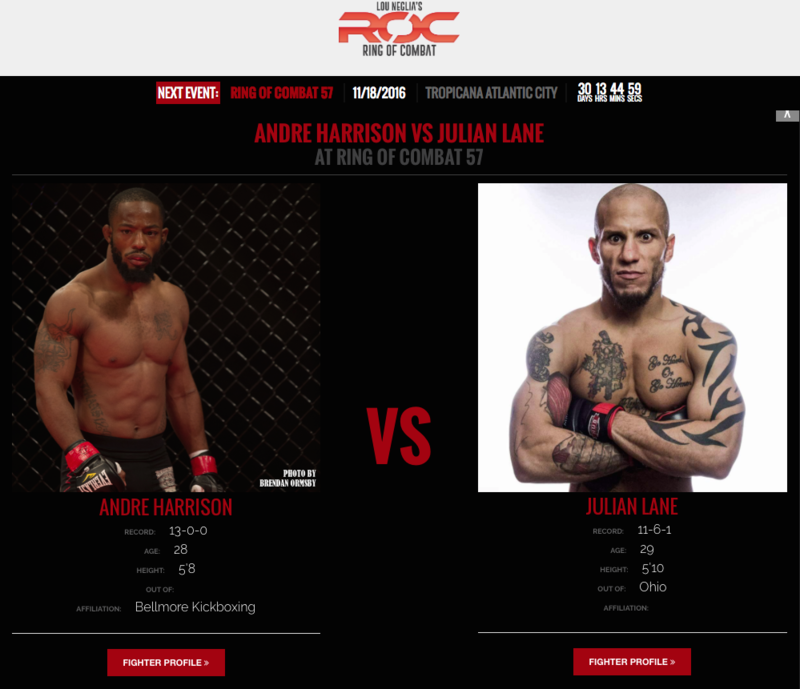 Though the fight didn’t go as planned for Lane, he showed fight fans what ROC is all about and now he returns to take on Andre Harrison in what is sure to be one of many wars at ROC 57. Tickets can be purchased online or at the Tropicana box office and/or any Ticket Master outlet. Get yours TODAY!! !